I got introduced to Gujarati farsan from quite an young age. 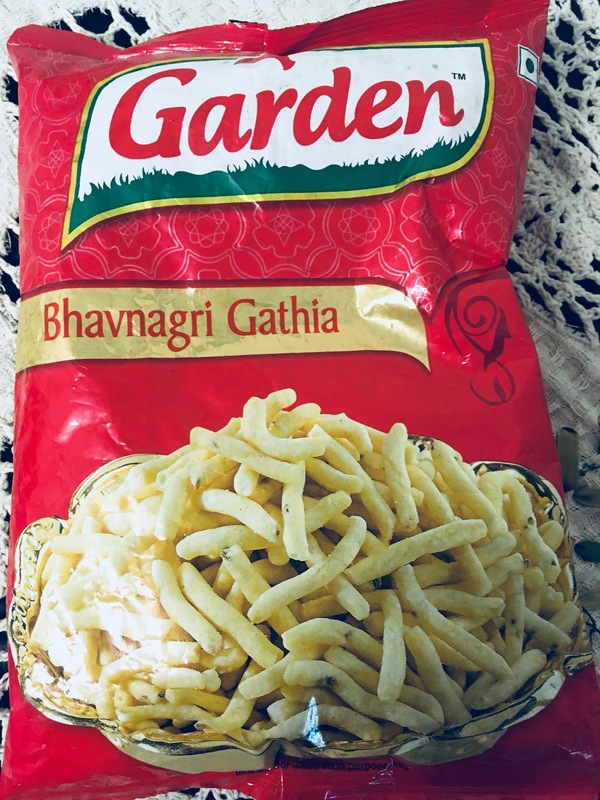 Being a Mumbaikar, bhavnagri gathia was not new to me. 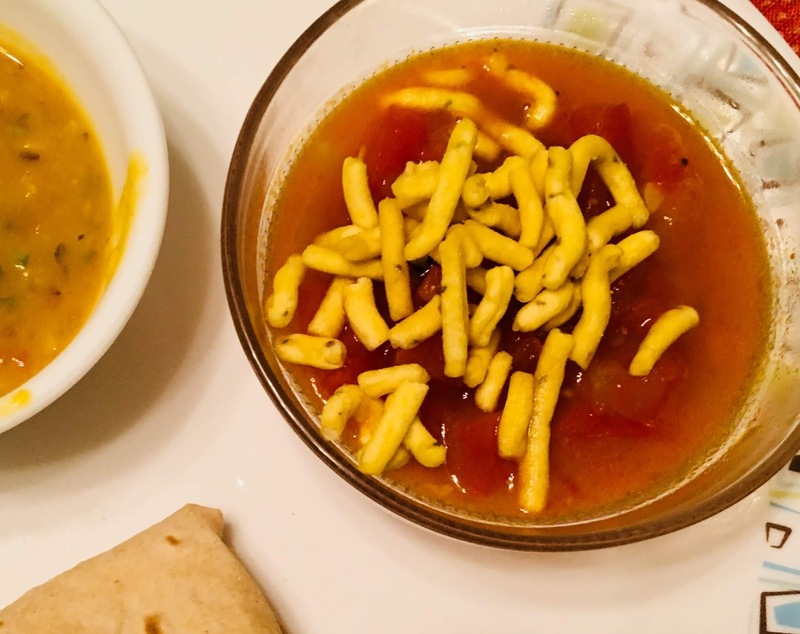 There were many farsan marts near our house that used to dish out samosas, batata wadas, kachoris, dhoklas, khandvis, different types of sev, mixture, jalebis, gulab jamuns, pedhas, burfis and ladoos. Did I name them all? Salivating already! Well, these shops did sell all these and much more, creating a culinary paradise for us kids back then. 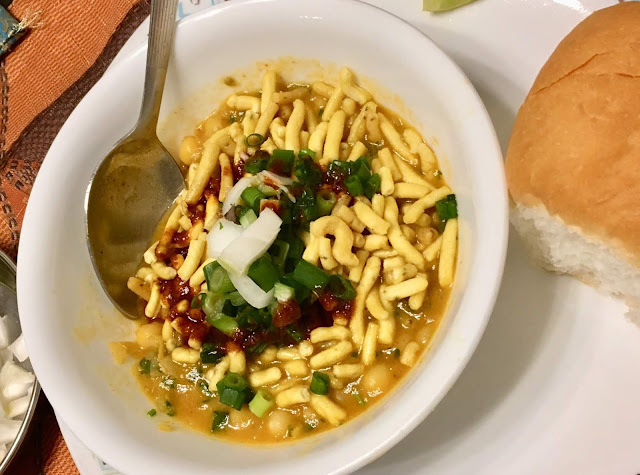 Initially, I used to think that farsan meant a particular mixture of fafda, sev, boondi, peanuts, etc - basically a mixture, which was a permanent feature in our house. I never considered other snacks as farsan. Little did I know that the term 'farsan' literally meant salty snacks and included all things fried/steamed/baked and salty. Temper the hot oil with mustard seeds and asafoetida. When the seeds splutter, add the garlic and saute it lightly. Then add turmeric and chilli powder followed immediately by the chopped tomatoes. Mix them well. Add salt, jaggery powder and cook it covered for 2-3 minutes. The tomatoes should not become mushy but should retain some of its chunkiness. Add water to adjust the consistency. Here, the dish should have a slightly soupy consistency for the sev to absorb the flavourful juices. Again, cook it covered for a few minutes, adjust the seasonings as per taste and the dish is ready. 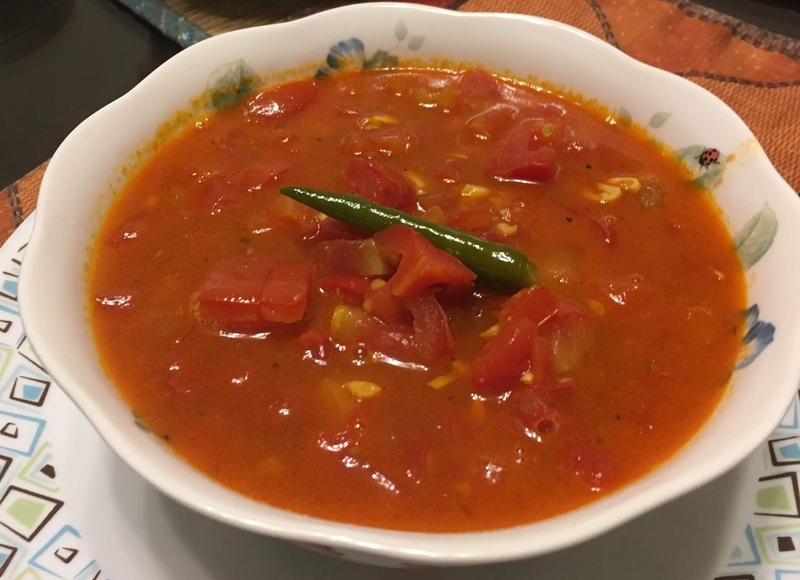 Add the sev to the tomato sabzi just before eating and enjoy the sweet, sour, spicy and garlicky flavour of this fast dish. This is best eaten with hot phulkas or rotis. Another dish which is a favourite in my house is the Sev Usal. 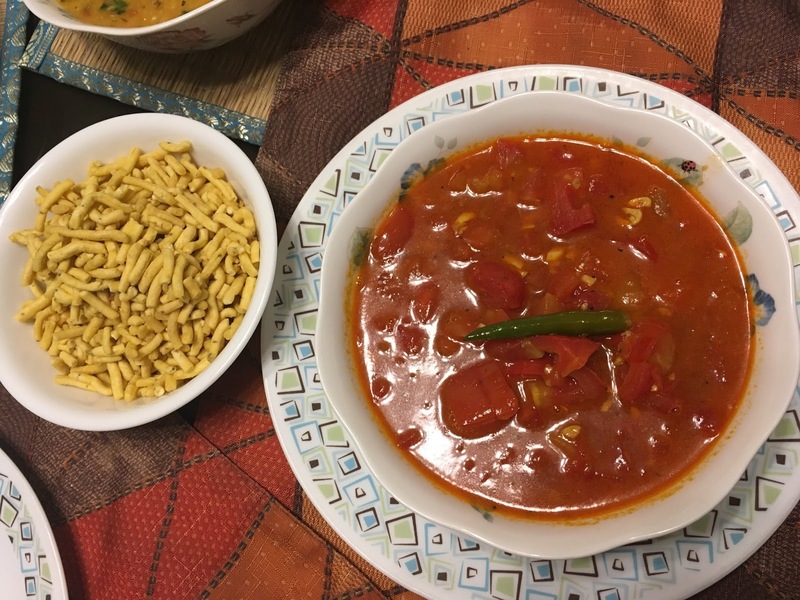 Usal is a Maharashtrian gravy made of beans such as matki, moong, lobia, peas etc. It is usually relished with pav. Boil the soaked peas in a cooker by adding some salt. The peas should not get mushy. So around 3 whistles ideally should be good enough. In a kadhai, heat the oil and add the onions along with the ginger-garlic paste and green chillies. Fry it till the onions turn pink and translucent. Add the powdered masalas except the garam masala & meat masala and saute for a bit. To this, add the chopped tomato and cook till the tomatoes get mushy. Add the mashed potato and boiled peas to this mixture. Mix it well. Add water to adjust the consistency. Add the jaggery to complement the tartness of the tomatoes. Towards the end, add the garam and meat masala and allow the gravy boil to boil for a couple of minutes. Get a consistency of your liking. The mashed potato quickly thickens the gravy. The gravy should not be watery but should be liquid enough for the sev to mix in well. Heat oil in a small tadka pan. Add the chilli powder to the hot oil, mix it well immediately followed by water. Allow the mixture to boil. Please be careful while adding water to the hot oil. That's it...the tarri or the chilli sauce is ready. Serve the usal in a deep bowl or a vaati. Garnish it with coriander leaves, chopped onions, the sweet and sour tamarind-dates chutney and a spoonful of tarri. Add the sev on top and squeeze lemon juice over it. Mix it well and scoop the deliciousness with pav.